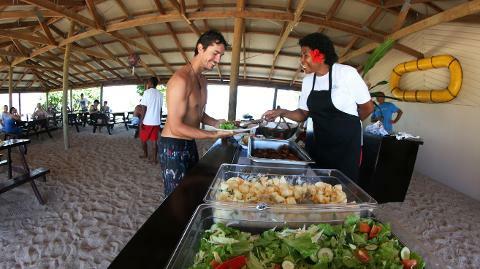 Avoid the daily rush of day cruise departures and meet at Denarau Marina for a leisurely 10:00am departure on the M.V. 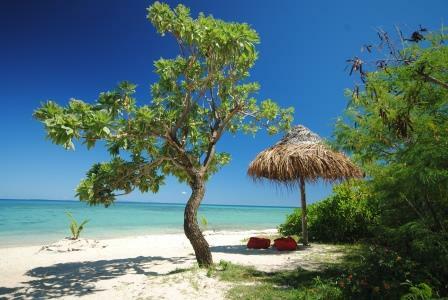 Oolala which heads over tranquil waters to the exquisite private Savala Island. Enjoyable for both adults and children alike with the interactive staff providing continuous entertainment and an exciting insight into Fiji’s lifestyle and handicraft skills. 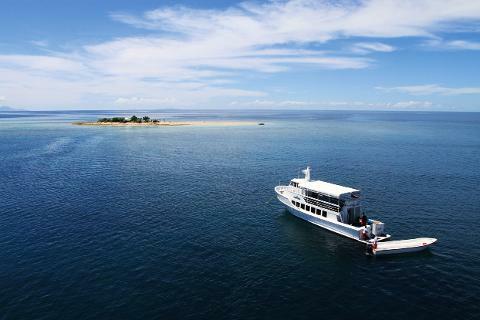 This boutique day cruise company offers an exclusive Fiji experience for visitors who prefer a more boutique day trip ideal for travellers who want “simply the best” with tours limited to smaller numbers. The M.V Oolala cruises over blue water for an hour and a half to reach Savala Island guests are shown points of interest around the waters and islands and can enjoy morning refreshments and home-made banana cake and fresh scones on the journey. 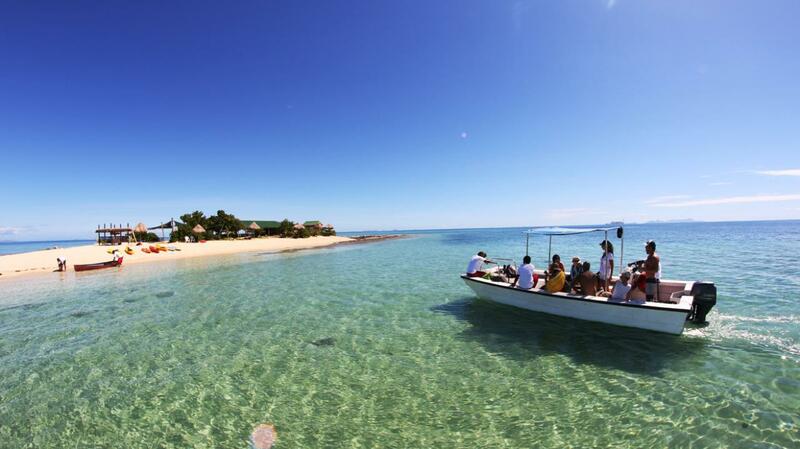 You soon arrive at the sandy cay for your four hour stay and a smaller transfer boat takes you to land on the tropical island and sanctuary that you will share with a variety of birds and unique marine life during your stay. Guests respect the pristine environment and leave only their footprints in the island’s beautiful white sandy beaches which are fringed with vibrant coral and crystal clear waters. Trained staff accompany guests on snorkeling expeditions in the pristine waters and point out the myriad species of fish and brilliant corals giving special care to novice snorkelers and children. Guests have the option to simply relax on the beach in bean bags on the sand or under the 'bures' (small shade huts), or enjoy a ride on a glass bottom boat. Non-motorized water activities are also available and you can try your skills at kayaking or stand up paddle boarding. Children especially enjoy the fish feeding while young and old are fascinated by “the tale of the coconut” when the resident storyteller explains how the coconut has so many uses in everyday life on the island, including how to enjoy coconut milk and flesh and how to weave the leaves into mats, baskets and hats. For an additional charge, you can indulge in open-air therapeutic massage treatments on the island. 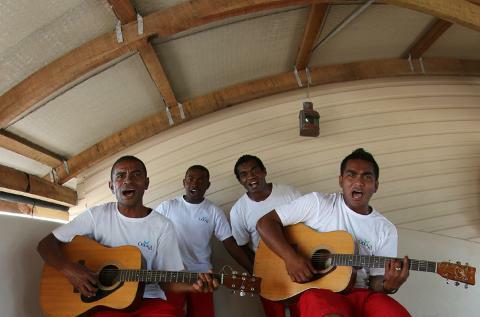 After enjoying a delicious buffet lunch under the shade of the main bure, guests enjoy the happy songs from the islanders who ensure that everyone has a happy and memorable experience of the 'real' Fiji for last hours of their stay before being transferred back to M.V. Oolala for the return voyage to Denarau Marina. The M.V. Oolala returns to the Denarau Marina at 4.30 p.m. and complimentary transfers to Coral Coast, Nadi and Denarau hotels are included. Also included in the unique cruise experience is morning and afternoon tea, a scrumptious BBQ lunch; complimentary drinks all day, including beer, wine, soft drinks and bottled water, complimentary use of snorkeling gear, kayaks, stand up paddle boards and glass bottom boat tours. Swim wear, towel, camera, sun hat, sunscreen, and money or credit card for optional massages, scuba diving and souvenirs.